A very unfortunate accident which could have been prevented with proper communication and signage. This fatality in Thailand . 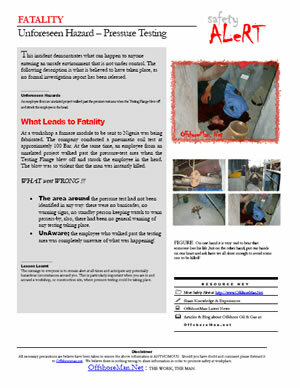 Below is a HSE Bulletin for you to share the information with others. On one hand it is very sad to hear that someone loss his life ,but on the other hand, put our hands on our heart and ask have we all done enough to avoid some one to be killed? Lets circulate this to others and discuss lesson to learned. Author (also the WebMaster) hold a degree in Mechanical Engineering from University of Malaya. He has extensive experience in offshore construction and currently employed by one of the Major Offshore Construction Company in Malaysia. Vent Boom Collapsed. 1 Fatality ! & 3 Badly Injured. Pipeline Repair : Petronas sharing the pool of emergency pipeline repair equipment with its local PSC. Offshore Rig Jobs – Are You Making These 7 Mistakes In Your Cover Letter? OffshoreMan : The Work. The Man. 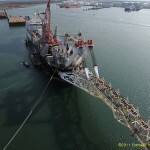 Is a blog about Offshore Oil & Gas. 2015 © OffshoreMan : The Work. The Man.